Illegal Arab road being built in Binyamin poses safety hazard for drivers on adjacent main road, but work continues nevertheless. Illegal road works; this morning. An illegal road has been paved in recent weeks by Arabs in West Binyamin, near the Rantis Junction and the town of Beit Aryeh. These works are carried out within Area C, which is under full Israeli civil and security control, by Arabs from the village of Luban, and includes land preparation for construction and preparations for paving a road to a nearby village. Two weeks ago, members of the "Regavim" lands preservation movement sent an urgent appeal to the Civil Administration that the work being carried out without a permit is also a very serious safety hazard, since it is located adjacent to the Trans-Binyamin Highway, the main road in the area. 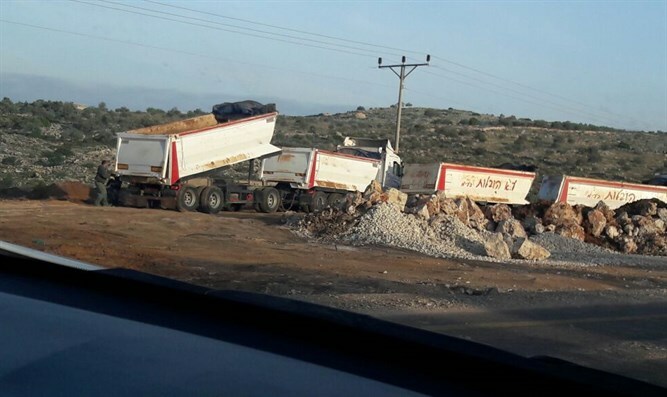 As a result of the trucks moving to the illegal construction site, the main road was filled with stones and mud, causing a safety hazard for passengers on the road. Despite the letter of warning, the work at the site continues uninterrupted. On both Monday and Tuesday, heavy equipment continued working there. To read the warning letter in the original Hebrew, click here. "The fact that the Civil Administration does not go out of its way to deal with this hazard," says Oved Arad, the coordinator of the Judea and Samaria area in the Regavim movement, "constitutes contempt for human life." "The Civil Administration's supervision unit issued a stop-work order against illegal construction and enforcement is in place," the Civil Administration said in response, "we are sorry that the organization chooses to make baseless accusations against the Civil Administration."